Is beag caint a bhí ar pheil i gCeantar na nOileán tar éis an chogaidh mhóir go dtí tús na seascaidí arís. B’fhaisean le múinteoirí na nOileán i ndeireadh na gcaogaidí agus i dtús na seascaidí laethanta lúthchleasaíochta agus peile a reachtáil ar churrach an Mháimín ó ham go chéile. Seachas sin ba ar an Trá Mhóir, ar an Trá Bháin agus ar chorrach an Mháimín a thagadh leaids óga na háite le chéile le cic a bhualadh ar bháire. Na buachaillí sin a raibh spiorad na peile iontu mar a bhí ina gcomhghleacaithe rompu d'imir siad le Cumainn Peile eile ar nós Piarsaigh Ros Muc agus Cumann Peile na Ceathrún Rua. Orthu sin bhí Diarmad Mac an Adhastair, Nioclás Ó Conchubhair agus Pádraig Ó Máille. Bhí tuairim forleathan sa gceantar ag an tráth sin go raibh an oiread fear óg i gCeantar na nOileán féin d'fhoireann peile dá gcuid féin. 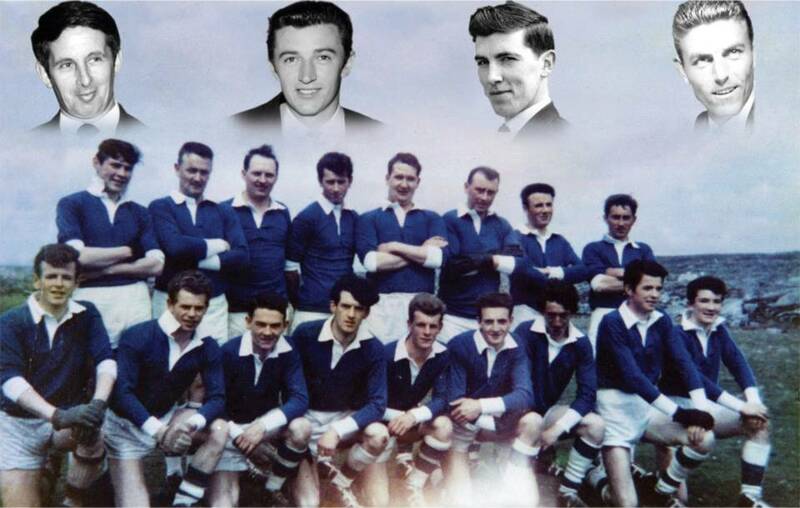 Tháinig an tAthair Micheál Ó Flannabhra mar shéiplíneach go Tír an Fhia sa mbliain 1961. Fear é a raibh suim mhór aige i gcúrsaí peile agus i bhforbairt pobail. Bheartaigh sé féin agus Jimmy Rua Mac Cormaic, iar-chaptaen airm as Tír an Fhia, Pádraig Ó hUallacháin, garda a bhí i Leitir Móir ag an am, Michael Mór Ó Conghaile, Maitiú Mac Donnchadha agus go leor daoine eile Cumann Peile a bhunú i gCeantar na nOileán. Tháinig suas le scór duine le chéile i Halla Thír an Fhia i bhFómhar na bliana 1964 chun cumann peile a bhunú. Ba é Maitiú Mac Donnchadha, príomhoide Scoil Leitir Móir an chéad chathaoirleach a bhí ar an gCumann agus Tomás Ó Durcáin, príomhoide Scoil an Droma an chéad rúnaí. Socraíodh go ndéanfadh Jimmy Rua Mac Cormaic an fhoireann a thraenáil i Hall Thír an Fhia mar nach raibh aon áit cheart traenála sa gceantar. Tugadh Cumann Peile Naomh Anna Leitir Móir ar an gCumann nua. Bhíodh peileadóirí ag cleachtadh ar churrach an Mháimín mar nach raibh aon áit eile níos feiliúnaí ar fáil. Talamh fliuch, riascach ar a dtagadh an taoille air go minic a bhí sa gcurrach seo. Ba le Michael Johnny Mac Donnchadha an geadán talún seo ar dtús. Chuaigh seisean agus a chuid daoine muinteartha go Ráth Cairn na Mí i 1935. Ba le Coimisiún na Talún an currach ansin agus d'fhág an Coimisiún píosa den churrach ag buachaillí na háite le haghaidh peile. Chinn Cumann Peile Naomh Anna go ndéanfaí forbairt ar churrach an Mháimín mar pháirc chaighdeánach peile de réir rialacha Chumann Lúthchleas Gael. Bhí obair chrua mhall anróiteach roimh an gCumann nua ach bhí siad lán le misneach agus le dóchas.